Author: Martin Malden Published: May 1, 2016. Last updated: April 10, 2019. Why would your website’s page-load time be important. . ? Apart from the obvious answer (that people won’t hang around if your page takes an age to load), it’s an increasingly important factor in the algorithms Google and Bing use to rank your website’s pages in the search results. For visitors using mobile devices it’s even more important, hence Google’s recent announcement of their Accelerated Mobile Pages (AMP) initiative. Without question, page-load time (along with security) is one of the key areas that the web at large has focused on for a while. How do you make your website pages load more quickly? If your site is hosted in the US and someone accesses it from Australia, the page your visitor has requested will probably go through 20 (or more) ‘hops’ to get from your server to your Aussie visitor. (The World Wide Web is exactly that – a web, not a direct line). Plus your server (which will also be hosting hundreds of other websites unless you have a dedicated server), may be experiencing unusual peaks in traffic, operational problems, or any number of other problems, all of which will impact its response time. These factors are largely out of your control, and to mitigate them you may want to consider a Content Delivery Network. In its simplest form, a Content Delivery Network (CDN) operates a network of servers distributed around the globe. It takes a copy of your website from your server (referred to as the origin server) and stores it on each server in its global network. Then, when your Aussie visitor requests a page from your site, it’s delivered to them from the CDN’s server that’s based in Australia, not your origin server in the US. This means that your page only has to travel a fraction of the distance it did without the CDN. And, because the CDN is storing a copy of your website on each of its global servers, temporary problems affecting your server (the origin server) don’t affect the delivery of your web pages to visitors. What scale of improvement can be achieved using a CDN? 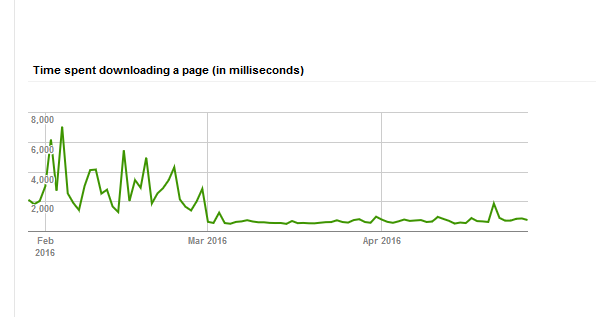 I had gone through all the steps I set out earlier to optimise my websites (as we do on all websites we build at Abledragon) but I was still getting inconsistent, and sometimes unacceptably slow, page-load times. So, at the beginning of March, I put my websites on to a CDN – and experienced a dramatic improvement in both the speed and consistency at which pages on my sites load. Difficult to argue against a result like that! So yes – page-load time is important and, as the web moves to mobile, it’s becoming ever more so. There are many factors that go into speeding up the time it takes for web pages to load and it’s important to get the foundations right first (those factors I listed earlier). If the foundations are not right you will still get some benefit from a CDN, but not as much as you could do and, therefore, you will not be getting the returns you should expect. So get the foundations right and then move your sites onto a CDN. For some more information on CloudFlare (the CDN on which this site is running) – click here.